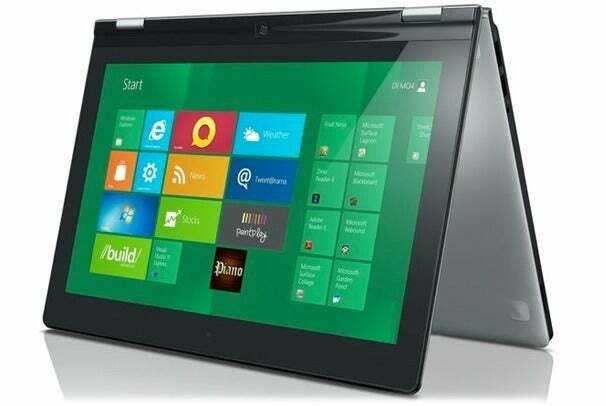 Lenovo plans to extend its ThinkPad line with business-friendly Windows 8 hybrid laptops similar to the convertible, flippable IdeaPad Yoga. Making tablet PCs is nothing new to Lenovo. The company currently offers a convertible model of the ThinkPad X220. Instead of the screen swiveling and folding like typical tablet PCs, however, the new Windows 8 ThinkPad hybrids will likely flip back on its hinge, just as the IdeaPad Yoga does, according to a report in The Wall Street Journal. This fold-over design would enable users to make use of the touchscreen in a few different positions for the laptop. The fresh, unusual design might also help these convertible laptops stand out--an important task, as many more hybrid Windows 8 laptops are expected this year. Windows 8’s touch-friendly Metro interface promises a better experience than ever before on a convertible tablet. However, since Windows 8 isn’t expected until at least the summer, we likely won’t see these new ThinkPad hybrids any time soon. Peter Hortensius, president of Lenovo’s product group, told the WSJ’s CIO Report that the tablets will be released sometime in the next 12 months. As business-oriented laptops, the Lenovo ThinkPad hybrids will likely offer enterprise-friendly features like TPM security chips for data protection and additional expansion and connectivity options. We might not be able to count on a matte screen, however (Lenovo went with a glossy display for the ThinkPad X1) or the classic ThinkPad keyboard. Signs that the laptops will probably get your IT Department’s blessing: Hortensius did say the laptops will better handle Windows-based corporate applications, come with custom pre-loaded software suites, and allow CIOs to control which apps are installed. For road warriors, the convertible ThinkPads might eliminate your need to carry both a laptop and a tablet around.